Gertie’s mission: to become the greatest fifth grader in the universe. Her reason? She has no relationship with her mother, who lives in another part of town. But when she learns her mom is about to move to another city, Gertie has to find a way to make her recognize and acknowledge what a terrific kid she is. Her plan appears to be thwarted on the first day of school by a new girl in class – pretty, instantly popular, and with a father who’s a movie director. Gertie’s grit, confidence, wild optimism, and even wilder imagination will make her the greatest fifth grader in your universe! Gertie Reece Foy is 100% Not-From-Concentrate awesome. She has a daddy who works on an oil rig, a great-aunt who always finds the lowest prices at the Piggly Wiggly, and two loyal best friends. 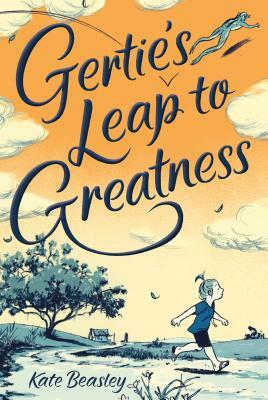 So when her absent mother decides to move away from their small town, Gertie sets out on her greatest mission yet: becoming the best fifth grader in the universe to show her mother exactly what she'll be leaving behind. There's just one problem: Seat-stealing new girl Mary Sue Spivey wants to be the best fifth grader, too. And there is simply not enough room at the top for the two of them. From debut author Kate Beasley, and with illustrations by Caldecott Honor artist Jillian Tamaki, comes a classic tale of hope and homecoming that will empty your heart, then fill it back up again--one laugh at a time. Kate Beasley holds a Masters in Writing for Children and Young Adults from the Vermont College of Fine Arts. She lives with her family in Claxton, Georgia, with two dogs, one parrot, lots of cows, and a cat named Edgar. Gertie's Leap to Greatness is her first novel. Jillian Tamaki is an illustrator and comics artist. She is the co-creator of Skim and This One Summer, and the author of SuperMutant Magic Academy and Boundless (2017). She has taught comics and illustration in New York City at SVA and The New School. She lives in Toronto.